In early 2018, we conducted a survey to gauge the rate of adoption of deep learning. We found a majority of respondents were planning to use deep learning in future projects. When asked what held back adoption of deep learning, the same set of respondents cited “lack of skilled people,” “data-related challenges,” and “compute resources” as the main obstacles they faced. We conducted another survey at the end of 2018, this time aimed at understanding adoption patterns for a broader set of AI technologies (not just deep learning). 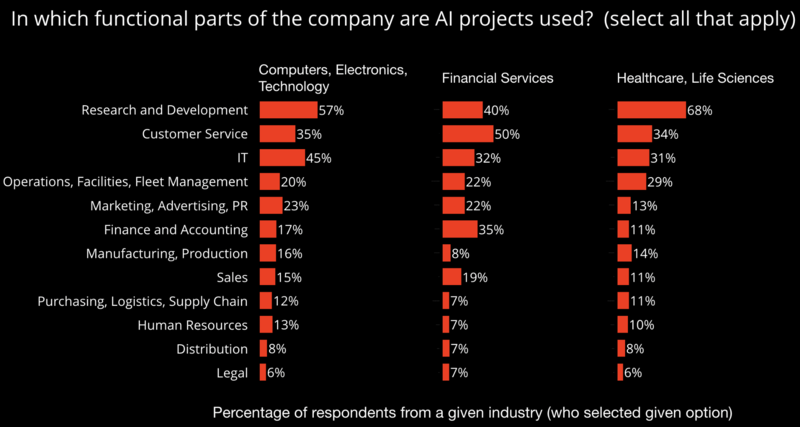 We found that companies that are just getting started using AI (what we termed the “evaluation stage”) cited company culture and difficulties identifying appropriate use cases as barriers to adoption. In contrast, those with more experience using AI technologies (what we termed a “mature practice”) cited “lack of data” and “lack of skilled people” as their main challenges. Much of the recent progress in research and tools is accessible to developers, and there are more instructional materials available as well. We are also beginning to see more case studies involving AI and automation technologies. Along with recent progress in models and algorithms, we’ll be showcasing tools, best practices, and use cases from leading companies at the Artificial Intelligence Conference in New York City, April 15-18, 2019. It’s also no surprise that even though deep learning is often associated with computer vision and speech technologies, we are beginning to see it used in areas where companies already have existing data sets and machine learning applications (specifically areas that involve text and time series). In fact, according to the survey results, structured data and text remain the main data types used for AI applications. One of the sessions at the conference will explore BERT, an exciting new language representation model that delivers state-of-the-art results in a wide range of natural language processing tasks. 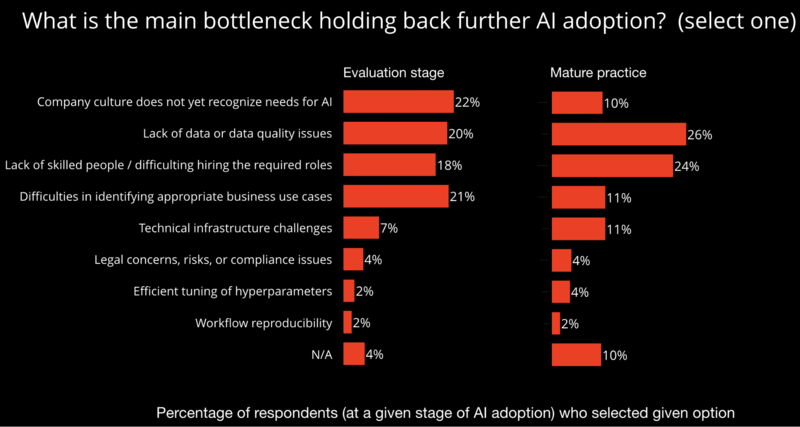 As I noted, respondents who work at organizations with more mature AI practices cited “data” and “lack of people” as the primary challenges they face as they attempt to adopt more AI technologies. When it comes to data, there are new tools designed to help companies overcome lack of data, including tools for generating synthetic data, simulation environments, and automation technologies designed to supercharge human labelers (Amazon Ground Truth is the most recent example). Improvements in tools have made AI more accessible for non-experts. Many machine learning libraries are open source, and many cutting-edge models (found in research papers) eventually get implemented in these libraries. In our previous survey, we found the top three deep learning tools to be TensorFlow (at the time, used by 61% of all respondents), Keras (25%), and PyTorch (20%). This year, we found a higher rate of usage for Keras (34%) and PyTorch (29%). We also are seeing improvements in tools for reinforcement learning: the most recent version of Ray now supports multi-agent reinforcement learning at large scale. Article image: Site barrier (source: Pixabay).